The AAP American Architecture Prize honors exceptional designs in 41 categories across three disciplines: architectural design, interior design, and landscape architecture. MetropolitanmomentuM won Silver Prize and Bronze Prize in the categories of Architectural Design / Misc. 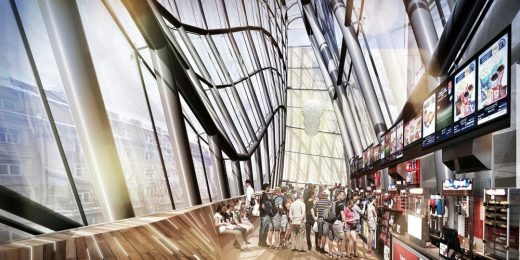 and Heritage Architecture respectively for Pushkinsky International Cinema Hall at Moscow – Revitalization. 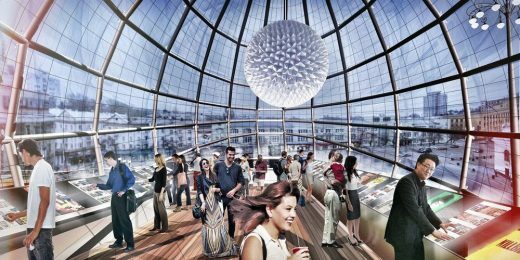 The project consists of the restoration of Pushkinsky International Cinema, the addition of two exterior glass towers, an interactive hub glass structure and a public recreational zone adjacent to Passion/Pushkin Plaza. The existing building is an architectural gem in the city of Moscow that suffered years of neglect. The new addition and its architectural elements attempt to recognize Pushkinsky cinema’s great history while also paving its path towards its future in the city of Moscow. The new building program is housed within two glass towers. The glass towers offer retail at its ground level, and concession stands and a book store on its second level. They become new façade elements that showcase the cinema’s restored splendor without covering the existing building from the public view. The glass towers work as special mediators between public and private areas. They invite the public in to enjoy the theater and experience the city. 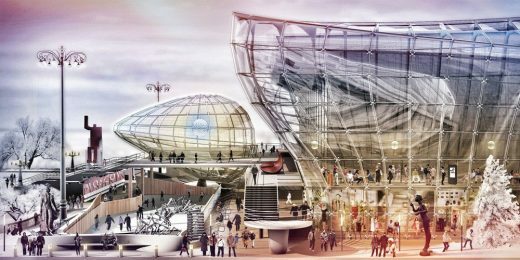 The new public areas outside the cinema consist of public art, a skating rink, a small amphitheater, and an interactive hub structure/information center. In addition, the project proposes improvements to its adjacent streets. Existing lanes are reconfigured in a new way. Therefore, Tverskoy Boulevard has newly dedicated bicycle lanes running along a green median strip. The bicycle lanes and the green median strip are sandwiched between car lanes and public transportation lanes. This new green core beautifies the street and ensures the bicyclists safety. The project provides recreational areas adjacent to its plaza, and a buffer zone in the form of glass towers mediate between the building’s private areas and its surrounding public parks. In addition, Passion/Pushkin Plaza connects directly with an ongoing local project led by the government of Moscow. It is called “My Street” and it aims to create 50 Kilometers of new pedestrian zones along Tverskaya Street. 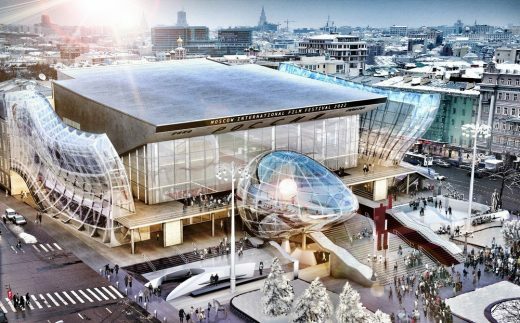 In sum, the Pushkinsky International Cinema Hall at Moscow – Revitalization project is a comprehensive design that considers the improvement of the existing building, its public pedestrian areas and its adjacent transportation corridors. MetropolitanmomentuM is a design studio located in Los Angeles, California. Its work focuses in analyzing, designing, and creating links between private and public spaces that ultimately connect/re-connect people, urban communities, and nature. Its projects aim to help revitalize/improve the quality of life of people in cities and/or key urban areas through architecture.